One would be extremely hard pressed to find an astromech droid that is as well traveled and experienced in saving the galaxy from the grip of the evil galactic empire than the lovable R2D2. Artoo, as he is also often referred to, is a little droid that has a big “heart”, so to speak, being able to walk through at least two Skywalker generations and providing help to their friends all the time, using his AI to help himself get out of some potentially sticky situations along the way. Perhaps it is time for Artoo to take things slow considering its age, and retiring in Japan does not sound all that bad considering how robots there have a role to play in the lives of the elderly there. 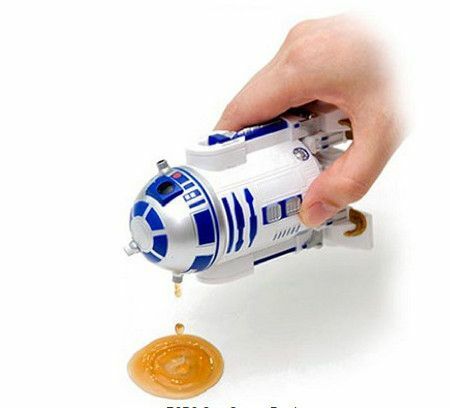 Why not go the whole nine yards then, and make itself useful in the form of the $12.95 R2D2 Soy Sauce Bottle? Your dinner will never be the same again, this is for sure.